I designed a chain and bead necklace a couple of years ago featuring a similar hot pink die cut flower on it for a class proposal. At the time, this kind of look hadn’t hit mainstream fashion hard and I think it was just a skootch ahead of the curve. Flash forward to 2010 and dimensional floral accents are EVERYWHERE! I’ve re-imagined it attached to this pretty painted pink bangle design using fabric paints, fabric markers and Aleene’s Liquid Fusion glue. I think this is one of those perfect ‘Back-to-School’ accessories for the teen fashionista. 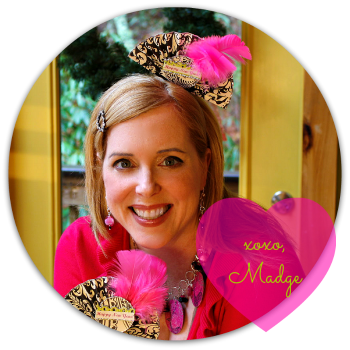 It’s flirty and fun and girly and right in step with what’s happening in the fashion mags. 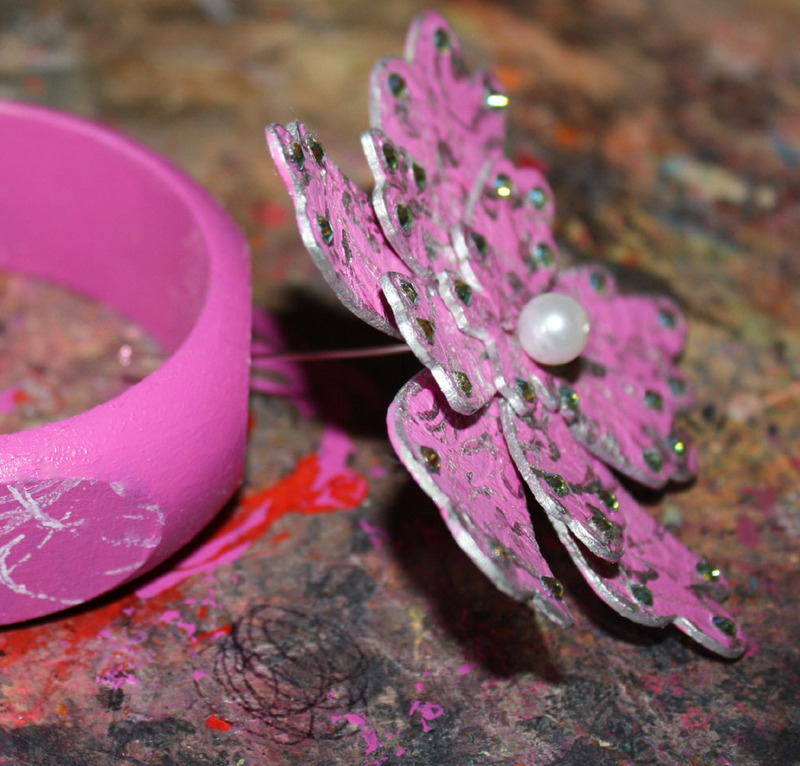 PLUS the flower spins around like a pinwheel, so it’s a kinetic design too! When those crystals get spinning, it’s really quite mesmerizing! This requires using an electric drill, so a little assistance from mom or dad may be required. You could opt to do smaller flowers and have them circle the wrist, but I’m a big and bold kinda gal and so is Miss Avalon, my resident teen. Take this idea where you like, express your individuality! That’s what crafting and fashion is all about. 1. 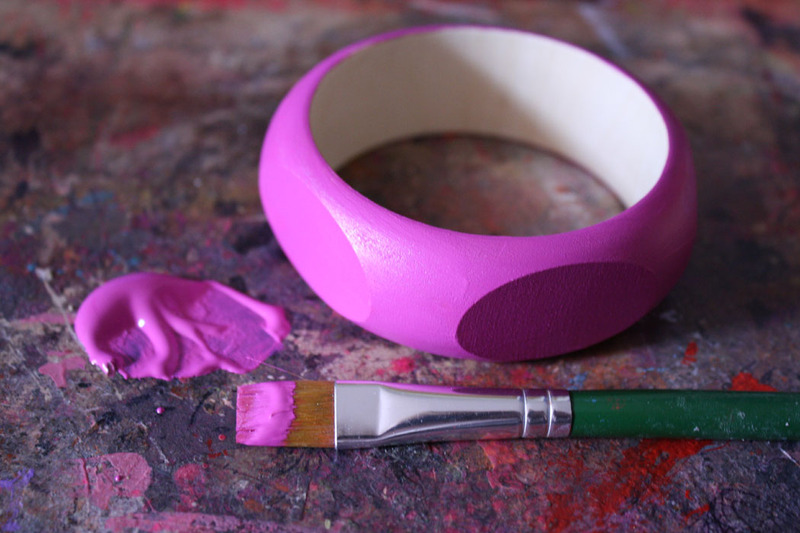 Paint several layers of azalea paint on inside and outside of bangle. Allow to dry between layers. 2. 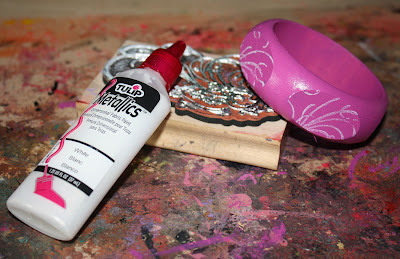 Stamp flat oval areas with flourish stamp and white paint. Apply paint with a foam applicator or brush to surface of stamp. Allow to dry. 3. 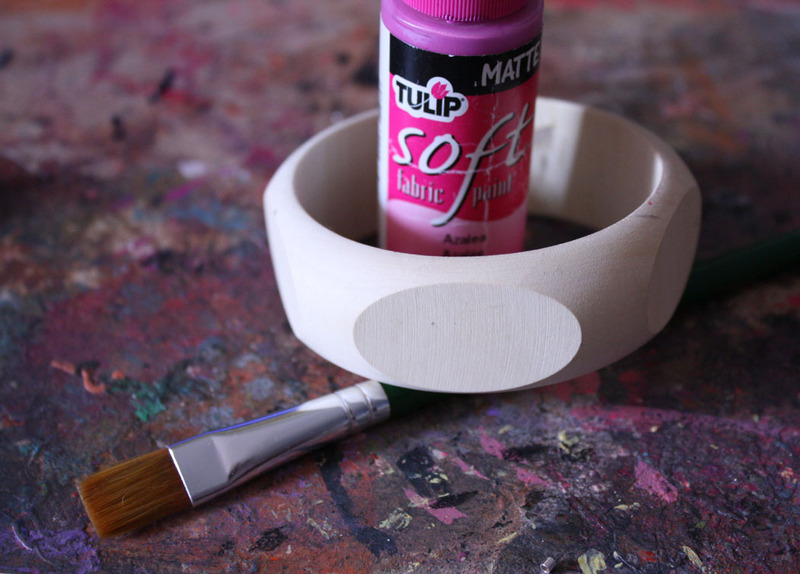 Mark center of one flat oval segment on bangle and drill. 4. Die cut flower out of Grungeboard using the Big Shot and the Bigz flower die. 5. Paint both sides of each layer of flower with azalea paint. Allow to dry. 6. 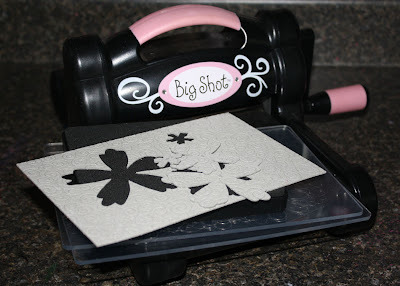 Use foam applicator and flourish stamp to apply metallic silver paint to surface of flower layers. Allow to dry. 7. Use a thin paintbrush or your foam applicator to edge the flowers with the metallic paint. Allow to dry. 8. 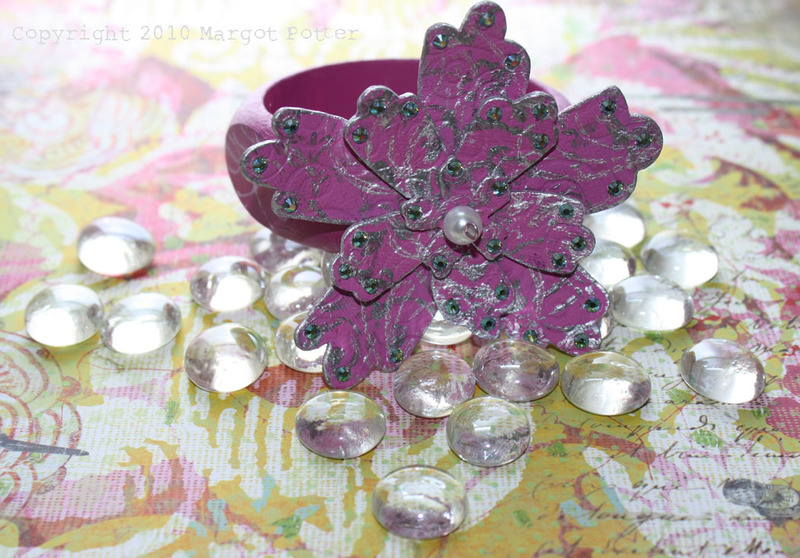 Glue flower layers together with Liquid Fusion. Allow glue to dry. 9. 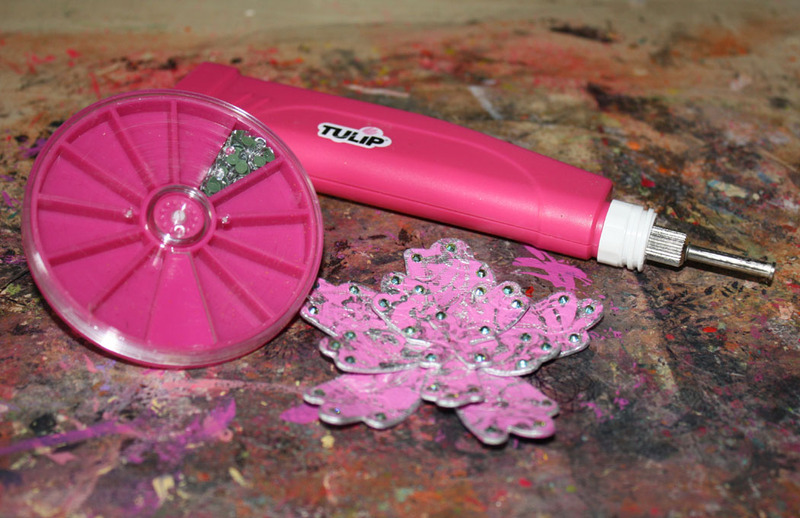 Use Tulip Glam-it-Up crystals and wand to apply crystals to edges of flower petals. What fun! 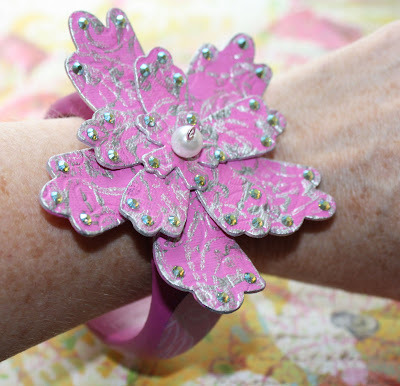 It looks like a lot of fun to make AND to wear!